Preheat oven to 400 degrees (on bake). Unwrap the chicken, pat her dry with a paper towel. Seriously. You have to touch the chicken. You will not die. Remove gizzards and giblets (aka the grossness). Make sure you get them all. Use two big spoons if you don’t want to use your hands. Place chicken in roasting pan. Put 2 Tbsps butter in a microwave safe bowl and melt (approx. 30 seconds). Pour this over the chicken and give her a good rubdown. She deserves it. Spices! I use Cajun seasoning, ranch dressing mix, and lemon pepper. Be generous. Cover the chicken with these. Place her breast side up (remember, her little hands should be waving at you). Put her in the oven uncovered, set the timer for an hour. Let her cook away while you do the following: Cut red potatoes in bite size chunks. Feel free to do a “rustic”chop. Put in mixing bowl. Drizzle with olive oil. Sprinkle with more Cajun seasoning and ranch mix. Mix well. Take chicken out of oven when timer says you have 40-45 minutes left. Distribute potatoes around the chicken. Return to oven while you do the following: Pour a small bag of baby carrots in that same mixing bowl. Drizzle with olive oil, sprinkle with lemon pepper and ranch mix. Mix well. Take chicken out when 30 minutes is left on the timer. Distribute carrots around, pour 1 cup of water over potatoes and carrots. Return to oven. Chop onion (cut off top, bottom, cut in half, peel and chop). Sprinkle onion over top of potatoes and carrots when 20 minutes is left in cooking time. Italian – Peel two garlic cloves, split them and place inside of chicken. Use Italian seasoning where recipe says Cajun seasoning. Mix in a can of tomatoes with the veggies when you add the onion. Garnish with fresh basil on top after cooking, if you want to be fancy. 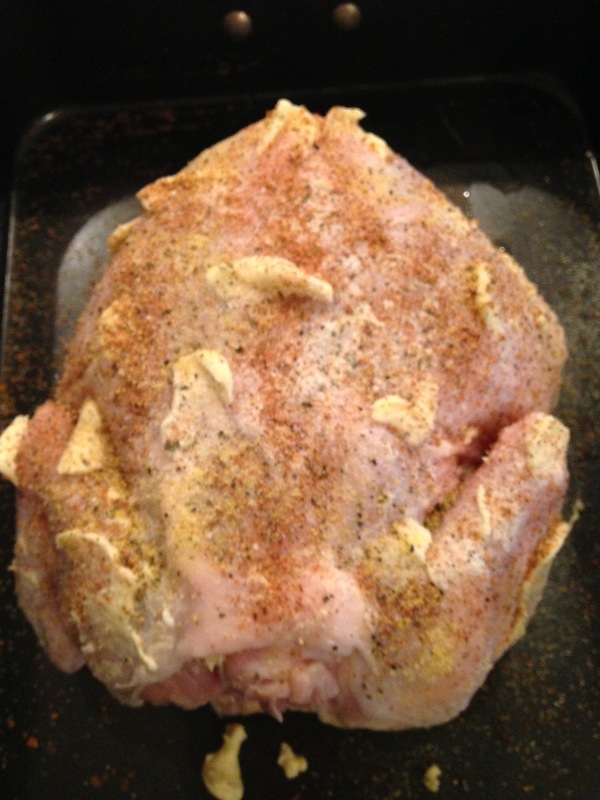 French – Use a split fresh lemon inside instead of lemon pepper on top of chicken. Use garlic salt, tarragon and thyme in place of other spices, and garnish with fresh thyme leaves. Cutting an onion: lay on its side. Slice off the top and bottom, turn over and cut in half. THEN peel. It’s much easier to handle this way. Tuck the edge of a paper towel under the end of your cutting board. Use your knife to scoot any waste trimmings onto the paper towel. When you’re done chopping, simply roll up and throw away. Voila! Clean work surface. Use two big spoons to scoop the grossness out of a chicken if you don’t want to touch it. Patting the chicken on its back doesn’t just help the chicken feel better. It helps your spices stick to her (when the patting is done with a paper towel). Roasted Chicken – Bible Time! Did you know that Jesus once said He is like a chicken? Read Matthew 23:23-38 ahead of time, so you know what you’re talking about. He wanted to bring together the families and the nation of Israel together and hide them under His protective wings. Like the potatoes and carrots tucked up under the side of our chicken, He wants us to nestle up close to Him and feel His love and protection. Do you know why He couldn’t do this for the Jews? Because time and time again, they killed the prophets and teachers He sent to them. They refused to listen because they thought no one had a better handle on the Law of God than they did. They demonstrated their understanding of the Law even by tithing of their spices – which is kind of interesting for a cooking class to know! Verse 23 of Matthew 23 says they gave 1/10 of all their mint, dill, and cumin. But He also told them they neglected the more important part of the law – justice, mercy and faithfulness. He told the Pharisees that because they didn’t demonstrate justice, mercy, and faithfulness, they were much uglier INSIDE than their spiffed-up OUTSIDES made them seem. Verse 27 is one you’re probably familiar with, where He compares them to “whitewashed tombs”- beautiful outside but dead and rotting inside. Encourage your families to look at it this way: if we put on our “rule follower” faces, and follow God’s Law to the letter, but we don’t practice fairness balanced with mercy and forgive others freely, we are just like pretty tombstones. Or maybe we’re like chickens, too. Full of nasty gizzards and giblets on the inside. Let God scoop out your grossness and prepare you to be beautiful. The Bible tells us in Matthew 23 that God’s sincere desire is to gather us together like a hen gathers her chicks under her wings. My prayer for you is that you feel His comforting presence and protection in the coming days and that you feel support and community from those around you. Thank you for allowing me to be part of those He “gathers together” around you by providing this meal. If you’re an over-achiever, and want to be ready to cook the first lesson tomorrow night while it’s still fresh in your mind, here are the things you’ll need. Recipe, instructions, and pics will be posted immediately after class. For your convenience, I’ve noted where the ingredients are located in our local Publix store.